Asparagus is the color and flavor of spring. The rolling hillside of my hometown appear to be large mounds of sprouting vibrancy now that there's been a few days of warm rain every now and again. The color of this delicious vegetable almost mimics that same hillside hue, announcing its attendance in the springtide symphony of green. 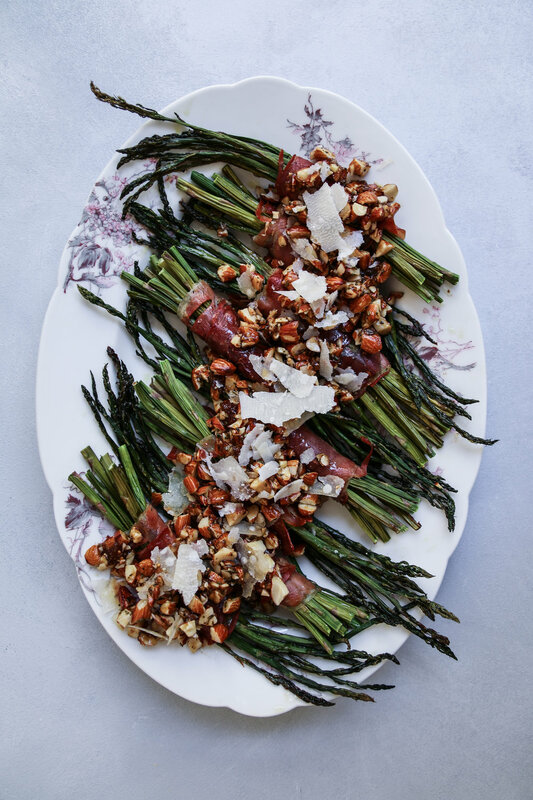 In this dish, vibrant stalks of asparagus are bundled together, wrapped in a toasted blanket of salty prosciutto. To set this dish apart, roughly chopped fig and rosemary glazed almonds are strewn across the clustered green stalks along with finely shaved parmesan. The tart, sweet and herbaceous qualities of the glazed nuts adds a contrast of flavor along with a bit of satisfying crunch. This dish serves well as an appetizer and is equally delicious accompanying a simple meal of fresh fish, creamy pasta or roasted chicken. 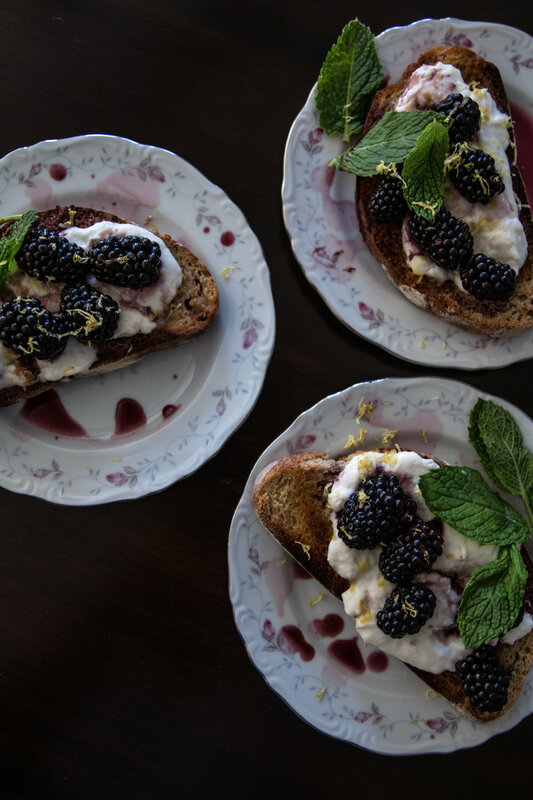 It is such a wonderful addition to any springtime supper, adding a flash of vibrant green to the table and mirroring the color of that emerald foliage spotted outside the kitchen window. *I found the prosciutto that I used to be quite salty, so not much salt - if any - is needed here. Heat a skillet over medium-low heat. While the skillet is heating, combine the roughly chopped almonds, finely chopped rosemary, and olive oil in a bowl until the almonds are coated with the herb and oil. 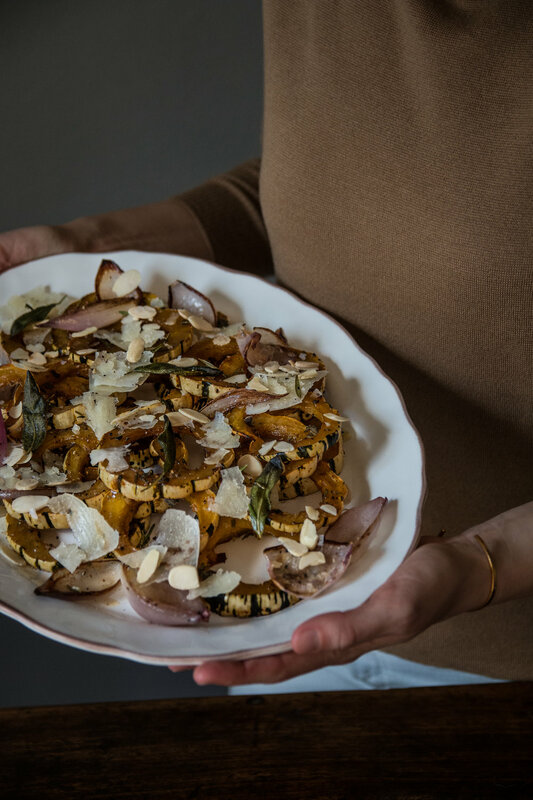 Spoon into the heated skillet and cook for about 5 minutes, until the rosemary is fragrant and the almonds are just toasted. Transfer back into the bowl, add the fig jam, mix until combined and set aside. Divide the asparagus. Depending on how thick or thin your asparagus stalks are, you can divide them into four clusters (if the stalks are thick) or eight clusters (if the stalks are thin). 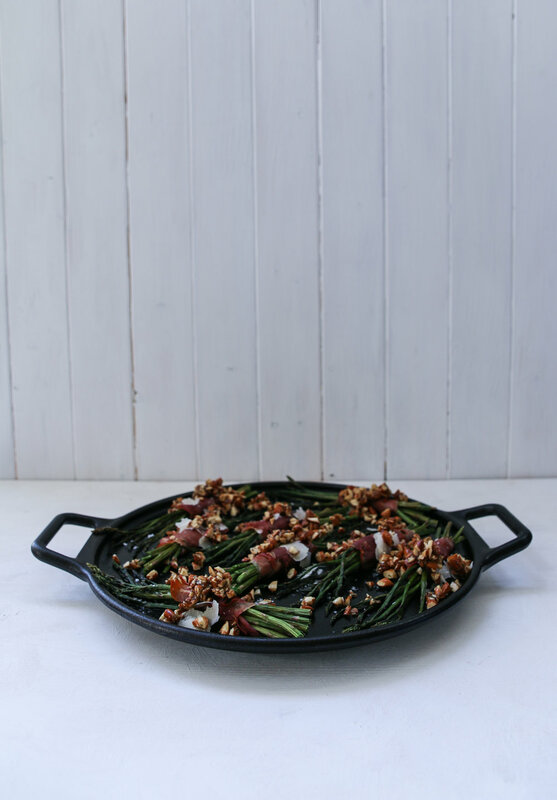 Wrap each cluster of asparagus with a piece of prosciutto, and place on a pan, baking sheet, or casserole dish (this is my favorite roasting pan to use). Drizzle each cluster with a bit of olive oil, and pop them into the hot oven. Roast for 25 to 30 minutes. 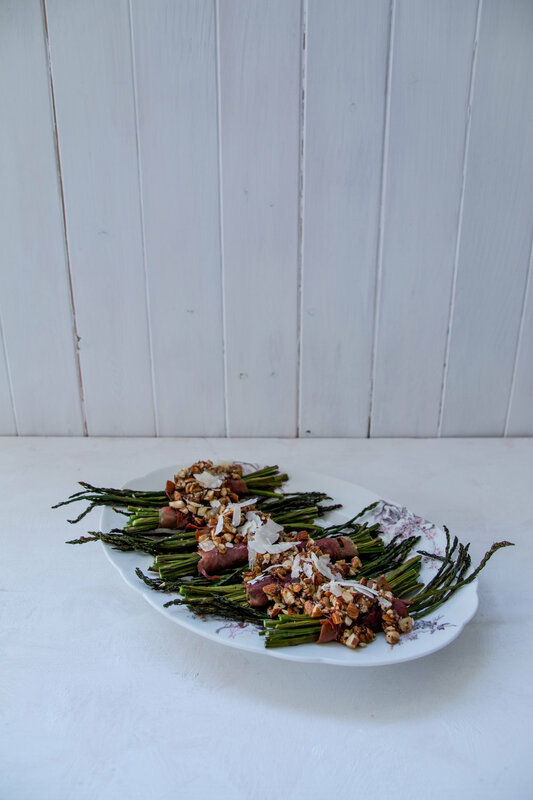 Top the roasted asparagus with the fig and rosemary glazed almonds, shaved parmesan, and a bit of salt and pepper, if you so please. 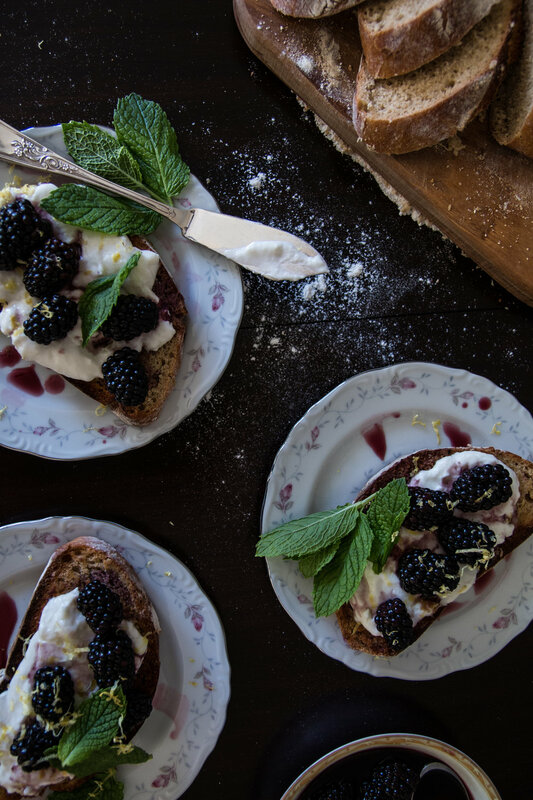 This would be lovely served alongside fish or roasted chicken with lemon and a glass of chardonnay.